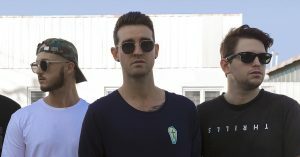 A unique blend of Pop, Funk, Electronic and Soul, Sunset City are taking over the Australian music scene with their infectious energy and cutting-edge sound. Summer 2019 is set to be a big one, with collaborations with ARIA-nominated artists and their first national tour. We caught up with lead vocalist, Parker Rose before their performance at Southport Sharks. Congratulations on releasing your latest single ‘Pockets’. What was the inspiration behind the song? It’s a funny story actually! I was at a bar in Hong Kong and as soon as I walked in the door, this gorgeous girl approached me and was super flirty. I talked to her for around 20-minutes, so naturally I thought I was a great conversationalist. I went inside to buy us drinks and when I went to pay, I put my hand in my pockets and couldn’t find any of my money. I went back outside to find her and she was gone – I realised I had been played! The guys found it hilarious so we started singing about it over the music we had been working on. It happened by chance in 2015. I was a solo musician, looking for a backup guitarist/singer. I found Matt through a friend and during a rehearsal at his studio his friend Rob jammed with us. It’s been us three ever since as Sunset City! Where can we can hear your music? You can find our music video for Pockets on YouTube and our music on Sunset City’s Spotify. Catch Sunset City’s performance on our main stage from 8.30pm on Friday, 18 January. As always, this show is free and non-members are welcome to attend.